Imagine having a parent with a debilitating disease; imagine taking care of them on top of school, work, a strong dedication to dance class and running your own non-profit organization. This is an average day for ARC student Bryanna Quinonez. Her mom, Juanita Quinonez is in the most severe stage of Lupus. Lupus is a chronic autoimmune disease and can be deadly. The signs are hard to detect and don’t warrant anything that would normally be considered fatal. Quinonez said it is her norm to take care of her mom. It would not be unusual to stay all night in the hospital beside her mom then head to school early in the morning – and it’s not unusual, because Quinonez has done this a countless number of times. 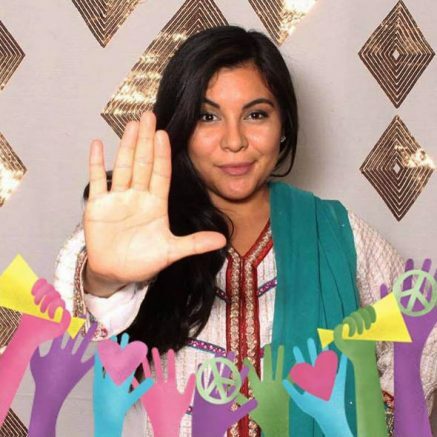 Not only is she the caretaker to her mom but, Quinonez is the CEO of the non-profit organization, “L is for Lupus.” The organization was an idea at first, and made into a reality by Quinonez herself. Juanita’s health problems are so severe that, “she could not go to jail if she wanted,” Quinonez said. She would be too expensive to take care of. When one has stage four lupus, like Juanita, the body’s immune system attacks the tissues and organs. It can affect the joints, skin, kidneys blood cells, brain, heart and lungs. Extreme fatigue and excruciating pain are symptoms that Juanita deals with almost daily. Although the symptoms can subside for weeks or years at a time, there has been little relief for Juanita. In an effort to help those, especially youth who have been diagnosed with lupus, Quinonez said her organization is big into community involvement and does things such as social welfare, counseling for newly diagnosed lupus patients, visitations to veteran homes and funeral flower arrangements. Even after a full day of school, work and dance, Quinonez teaches dance to children who have been diagnosed and she is going to arrange and throw a graduation party for a senior who recently found out he has lupus. It is rare that younger adults, especially adolescents, are diagnosed early on because it is difficult to diagnose. The signs and symptoms are very similar to other ailments. Though it is not always the case, a physical sign could be a rash on the face that resembles the wings of a butterfly unfolding on both sides of the cheeks. On the reverse side, ARC alum Claire Gabler spoke from her own experience about what it is like living with lupus. Gabler’s case isn’t as severe as Juanita’s. Her joints and mobility are affected rather than her organs. Gabler’s first outbreak was in college when her face broke out with the “butterfly” rash. “I deal with symptoms like ligament and tendon pain. Some days it is hard to get out of bed and walk,” Gabler said. One of the most misleading things about having lupus is ignoring the symptoms because they subside. “It subsided for ten years and it came back in my mid 30’s,” Gabler said. It can take months to years to diagnose lupus and there is no single test to do that. The methods that doctors commonly use are blood tests, medical history, complete exam, skin biopsy and kidney biopsy. There are a variety of speciality doctors that can help with the symptoms. The list is as follows: a family doctor, rheumatologist, clinical immunologists, nephrologists, hematologists dermatologists, neurologists, cardiologists, endocrinologists, nurses, psychologists and social workers. Although lupus can be debilitating and in some cases a death sentence, Quinonez stressed the importance of not letting it control your life. “You have lupus, lupus does not have you,” Quinonez said. Be the first to comment on "Student battles lupus with nonprofit"